Aleve belongs to a class of drugs known as NSAIDs—or Non-Steroidal Anti Inflammatory Drugs. Its purpose is to reduce swelling throughout the body, provide pain relief, and bring down fevers. Aleve is the brand name for naproxen that is available over-the-counter in most drug stores, and it comes in 220mg caplets, gelcaps or tablets. Aleve is known by many generic names, such as naproxen, Naprelan, or Naprosyn. This pain reliever is produced by many different manufacturers, such as Roche, Watson, Teva, and Roxane Pharmaceuticals. There are several different forms and strengths of Aleve with some requiring a prescription for use. The recommended starting dose for this medication is 220mg, but another 220mg can be used in two hours if one dose does not provide sufficient relief. Prescription naproxen is available in an 125mg per 5ml oral solution or in 250mg, 275mg, 375mg, 500mg, and 550mg tablets and patients should take them exactly as prescribed to reduce the side effects of naproxen. Aleve and naproxen are used for a very large range of conditions including headaches, toothaches, menstrual cramps, arthritis pain, and pain associated with minor injuries or surgeries. Its ability to reduce inflammation throughout the body makes it a great option for people who do not like to take pills every few hours; Aleve is known for providing complete relief with one 220mg tablet every 12 hours in adults. People who are involved in sports or who suffer from chronic conditions like arthritis or gout are often able to obtain relief from naproxen as opposed to using narcotic pain relievers. People using naproxen or Aleve on a regular basis should schedule regular exams with a physician. The primary active ingredient contained in Aleve is naproxen, which helps to relieve mild to moderate pain in the body. This ingredient works by reducing the level of prostaglandins in the body, which are responsible for controlling pain, inflammation, and fevers. Aleve successfully moderates pain because it blocks the formation of certain enzymes that stimulate the formation of prostaglandins in the body. As a direct result of the biochemical mechanisms of Aleve, mild to moderate pain is relieved in areas affected by inflammation in any tissue of the body. This non-steroidal pain reliever is effective in treating pain, inflammation, and fevers associated with a plethora of common medical conditions. The first thing you need to do when taking Aleve is to know what strength and quantity you need to produce effective pain relieving effects. Second, you will need eight ounces of water to drink after you take this drug for easy absorption and distribution. Additionally, it is recommended to take Aleve with food to reduce the formation of an upset stomach after consumption. 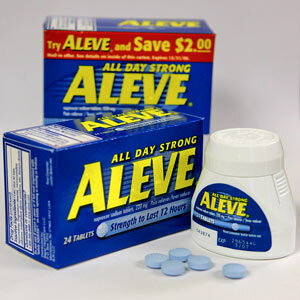 Pharmacists do not recommend taking Aleve more than two or three times per day, with at least ten minutes between doses. It is recommended to take only as much of this drug as needed to help relieve painful symptoms in your body. The continual use of Aleve can lead to health conditions such as ulcers, digestive disruptions, as well as increasing the risk of a heart attack. If you suffer from pre-existing health conditions such as kidney disease or heart disease, it is wise to alert your Doctor and Pharmacist before use. Furthermore, it is not recommended to take Aleve in conjunction with other pain relievers to avoid possible drug interactions and side effects. In general, Aleve is a safe anti-inflammatory pain reliever that can assist individuals with pain management that is needed to regulate optimal health levels in the body. Caffeine is a natural stimulant that is present in so many products that nearly everyone consumes some amount of it. Caffeine can be found in coffee, tea, soda and chocolate.